Whether you are a beginner, intermediate to advanced musician or just learning to play is simply something you have always wanted to do, we have a place for you at The Performance Academy. We offer a wide variety of programs, curriculum, Master Classes and private lessons tailored to individual needs. We offer private, one-on-one guitar lessons, vocal lessons, piano lessons, bass lessons, and cello lessons here at our facility in the Stonebridge section of McKinney, right in the heart of Adriatica. We also offer student recitals in our Event Center every 8 weeks at no additional charge. Our faculty is made up of seasoned professional musicians that work in today’s music business. Our atmosphere and environment is one of encouragement and a commitment to excellence while understanding that making music and an inquisitive spirit is essential to creativity. Music is a powerful catalyst for personal growth. 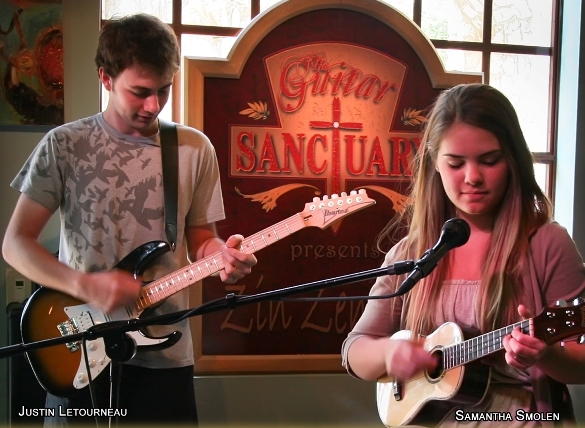 Discover your creative journey at the Guitar Sanctuary’s Performance Academy. Upon enrollment, a lesson time will be assigned based on the instructors' time available. Since the teachers are contracted and paid per scheduled lesson, students are required to attend all scheduled lessons on time. Please be sure to choose a time that you can commit to on a regular basis. If the student is 10 minutes late, they will be considered absent and the teacher will not be expected to wait. If the teacher has to miss, a qualified sub chosen by the instructor will be provided. For student’s missed or cancelled lessons there are no refunds or credits. Students who cancelled a lesson due to an extenuating circumstance please consult your instructor for his/her individual makeup policy. You may withdraw with a 30-day notice from the first of the month.